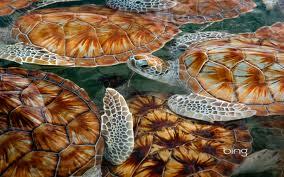 Green sea turtles have an olive brown to black colored carapace with each scute displaying a sunburst pattern. Their names is derived from the green colored fatty tissue under the shell that has historically been used to make turtle soup. 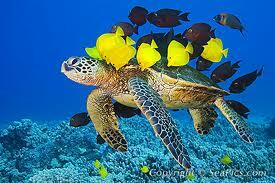 The green is sometimes referred to as the “black sea turtle” and two subspecies have been identified. The Atlantic green and the Eastern Pacific green turtles population are currently under some debate by scientists as to whether they are subspecies or actually separate species. Genetically, they are still very close though not identical. 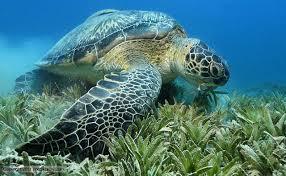 The green turtle has a wide disruption, preferring the tropical and subtropical areas near continental coasts and around islands. They tend to migrate primarily along the coasts from nesting to feeding grounds, though some populations are known to travel across the Atlantic Ocean. Distinguished by a small head and tear drop shaped carapace adult green turtles grow to around 5 feet in length and can weigh on average anywhere from 150–420 ponds. Greens mate every 2-4 years laying 3-5 clutches of 100-200 eggs per season. Juvenile green eat invertebrates like crabs, jellyfish, and sponges, but unlike most sea turtles, adult greens are herbivorous, feeding on sea grasses and algae in shallow bays and lagoons. Their beak is especially adapted for this type of feeding behavior as there mandible is heavy serrated in the anterior region of both the top and bottom jaw.